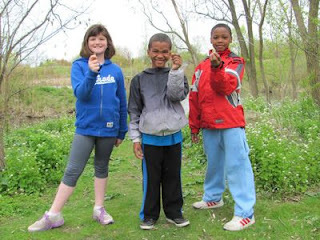 Students explore hidden nature in the city. James S. Bell Junior Middle School students Briar Harling, 9, Jaiden O'Brien, 8, and Ethan Butler, 9, joined their Grade 2/3 class Monday at Colonel Samuel Smith Park for outdoor nature programming hosted by Humber Arboretum's Centre for Urban Ecology. Here, they show off some of the unique leaves they collected during a biodiversity game. A morning of flower picking, leaf collecting, bird watching and nest spotting had kids from James S. Bell Junior Middle School marvelling with wide-eyed enthusiasm at Mother Nature Monday, as Humber Arboretum kicked off its first season of nature programming at Colonel Samuel Smith Park. Lucy Woods and Justice McChesney, both 7, were among the 19 students in grades 2 and 3 to get first crack at enjoying the May-June pilot project, which is aimed at south Etobicoke elementary school classes. Neither could contain their excitement at all they'd learned during the morning's Plants program, led by Nature Interpreter Chris Bialek. "I learned that plants are an important resource in nature because they keep us alive by making us oxygen and food," Lucy declared proudly. Added Justice: "Plants are great! They help us breathe, but some are very poisonous and can hurt us, so you have to know the difference." Already a fixture for many northern Etobicoke schools at the college's North Campus (near Hwy. 27 and Finch Avenue West), Humber Arboretum's Nature Programs kicked off its inaugural season at the college's Lakeshore Campus this week with the James S. Bell visit. The southern migration of the programming came as a natural move, Bialek said, given that Humber's Lakeshore campus is nestled in one of the city's most diverse urban green spaces - Colonel Samuel Smith Park. "It's such a great area out here, and we really want to try and get as many schools out down here so the students can come and experience nature," he said. "The big part is making the kids think that nature is fun and that it's not going to hurt them. Some are terrified of snakes and everything else, so this is about teaching them that they're not going to get hurt and that they're going to have fun." This May and June, classes ranging from grades 1 to 8 can sign up for a multitude of curriculum-connected programming meant to enhance and bring to life the science-based lessons they learn in the classroom. From Magnificent Monarchs, to Amazing Animals, to Cool Coyotes, each program offered caters to specific grades. (See sidebar for a full list of available programming). Monday morning's Plants program, which had Daunet Morrison's grades 2 and 3 class out scavenging for as diverse a collection of leaves as could be found, perfectly complimented a unit she's currently teaching on biodiversity. The whole program, she said, was a fun - and eye-opening - experience. "It's absolutely incredible down here. I didn't even realize this (parkland) was here," she said. "It's been a great day so far." A full day of Humber Arboretum's Nature Programming (which includes a morning and an afternoon program) down at Colonel Samuel Smith Park costs $11.50 per student participant (not including HST) - but Morrison's class, plus five other lucky classes, got a discounted rate, thanks to a subsidy generously donated by Citizens Concerned about the Future of the Etobicoke Waterfront (CCFEW). "We thought, just to jump start the program, we would offer a subsidy of $5 each for the first 150 kids," said Barbara Keaveney, CCFEW's secretary. "There is so very little outdoor education now in the schools...and it's just so good for the kids to get out. (Colonel Samuel Smith Park) is the only location we know of that's on the lake in Toronto and there's also a huge diversity of wildlife here. There's beaver, fox, lynx, deer - and the birds are amazing, too. "The kids just love it." For more information about Humber's nature programming, email arboretum@humber.ca or call 416-675-5009. Using the trails of Colonel Sam Smith Park, take part in exploratory activities designed to look closely at nature. What is a habitat and why is it such a significant ecological concept? Learn about the four basic needs of all living things. 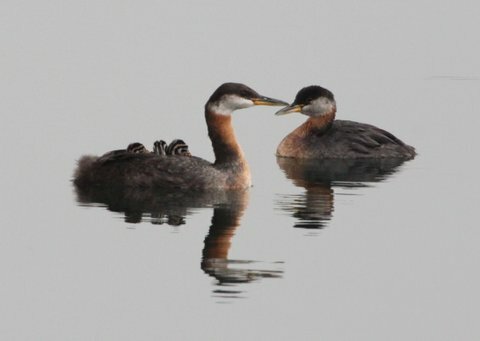 What makes birds unique? Learn where they live, what they eat, and how they behave. Feed the winter Chickadees. Learn about the amazing biology and behaviour of our local elusive coyotes (pups to adults) through a variety of games and activities. This program will lead students to better understand the importance of top on the Lakeshore and how to peacefully coexist with a variety of wildlife species. Students will have an opportunity to learn about the characteristics, lifecycles, and behaviours of Monarch butterflies (a species of special concern). A plant, migration, or cultural celebration focus can be provided. Trees play an important role in our lives. Learn about forest ecology, fruits, seeds, and tree life cycles. The First Nations People played many games. Have fun learning about their customs. Learn about different types of renewable energy and how we benefit from each. Learn about the importance of the variety of plants in our world. Uncover the differences between the animal groups. Wildlife native to the area will be emphasized. Examine and compare fascinating insects in different habitats. Are you aware of the many ways that humans rely on pollinators? Learn about the diversity of pollinators and find out how and why we should act to protect them! Play a variety of games and learn that everything plays an important role in nature. What is a watershed and how do you study one? Identify your watershed address. While learning about general plant characteristics, students will better understand how the Monarch caterpillar's only food source, the Milkweed plant, acts as a habitat for a community of interacting insects.